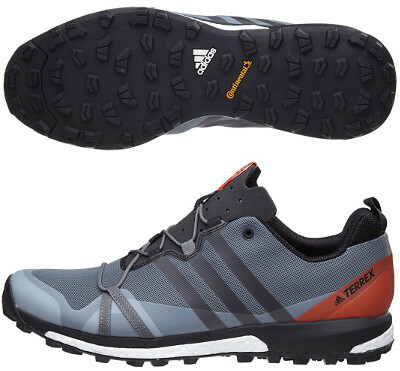 Adidas Terrex Agravic are neutral trail running shoes. The Adidas Terrex Agravic is a trail running shoe designed to enjoy short/medium distances over technical terrains (mud, rocks, etc.). It is heavier than its more agile sibling Terrex Agravic Speed (although it misses firm lateral support) featuring just 6 mm drop and not as narrow as its predecessor Terrex Boost. As expected, it includes world famous Boost foam in midsole and without doubt its best feature is the impressive outsole made in partnership with tyre manufacturer Continental. There is a waterproof edition with Gore-Tex® upper for adverse weather conditions. As mentioned above, the Terrex Agravic does not have robust (plastic based) reinforcements but fused ones over grid mesh which looks indestructible. However several users have complained about lack of durability in articulated area closer to toecap. Surprisingly thin EVA tongue is not gusseted to prevent dust and debris from jumping inside making more difficult to keep it in steady position. Lacing seems innovative covering the whole vamp to provide custom and snug fit. Midsole combines well-known Boost foam with firmer EVA over it featuring good consistency although more EVA has been added in the rear area to increase stability. The awesome outsole with deep and enough spaced to avoid mud accumulation and therefore traction loss has been made in partnership with tyre manufacturer Continental. It provides great traction on every terrain at the expense of durability.